There was a time when the notion of powered armor like the set Ironman wears was just science fiction, but that time is gone. So, while the geeks at io9 are still dreaming of the future we’re very much in tune with the work that is being done right now. We’ll go through some of the most impressive powered suits out there after the break. The first attempt at building a power suit we could find was GE’s Hardiman. In 1965, they began development on this hydraulic behemoth, but only managed to get one of its arms working properly, which could lift an impressive 750 pounds. Development was halted in 1970 after repeated failures to make the legs work properly. 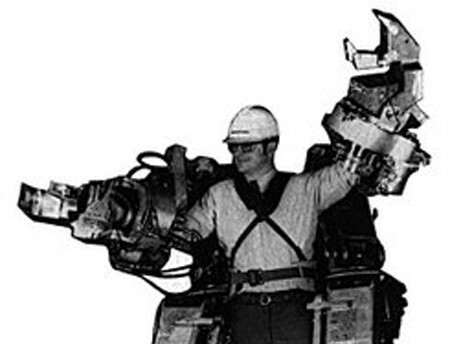 Interest in powered exoskeletons would only rise in the coming years. The next two decades were relatively quiet, with no notable advancements in the field until the mid 1980s. That’s when [Monty Reed], an Army Ranger who’s back was broken in a parachuting accident decided to begin work on his LIFESUIT. The LIFESUIT is designed to assist the disabled with normal tasks like walking and climbing stairs, with the hope of eventually producing a version that is quiet and small enough to be worn under normal clothes. After Reed spent much of his own money and made several design revisions and updates, the first LIFESUIT was produced in 2001. Additional prototypes were made in the following years, culminating in the most recent version, LIFESUIT 14, which weights about 75 pounds, is powered by compressed air. It can walk at speeds up to 2.5mph. Reed has made substantial progress, but without serious funding, the going has been slow. Given his aim to make the LIFESUIT wearable under the clothes, Reed might be interested to learn more about the Soft Pneumatic Exoskeleton designed by student [Che-Wei Wang]. It uses a CO2 tank to pneumatically assist the leg motions of its wearer. The soft materials mean it can conform to the body more naturally than a metal exoskeleton ever could, and it weighs in at a mere 6.5 pounds. While it does not boast the power of other exosuits, its light weight and pliable materials allow for a great range of natural motion. There is a slight noise problem though, as every assisted motion gives off a loud pneumatic hiss. For slightly less noise and a lot more power, look to the University of California Berkeley’s Human Engineering Laboratory: with major funding coming from DARPA, they developed the Berkeley Lower Extremity Exoskeleton, or BLEEX for short. It consists of a pair of leg braces, and a vest and backpack that attach to the brace armature, and a pair of modified combat boots that are firmly attached to the bottom of the braces. The backpack contains a small power source that delivers hydraulic power to the moving parts. The backpack can stow up to 70 pounds, but when the suit is on, it feels like only 5 pounds to the wearer. BLEEX’s top speed has been clocked at around 4mph. Unlike the LIFESUIT though, the BLEEX is not designed for the disabled. It is intended for use by able-bodied military infantry personnel, who often carry more than 100 pounds of weapons and equipment over long distances. 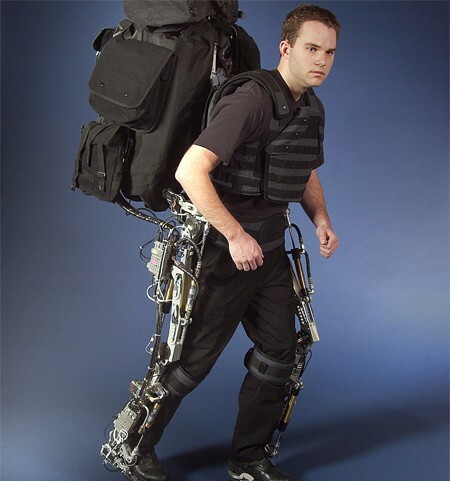 Another exoskeleton funded by DARPA is the XOS Exoskeleton designed by Utah engineering firm Sarcos. The XOS goes further than the other two by adding assisted movement to the upper body as well as the legs. With its powerful arms, the XOS can easily lift 200 pounds repeatedly with virtually no strain on its pilot. Development for the XOS focuses on its use in noncombat tasks such as loading missiles into planes, precisely the sort of task the Hardiman was designed to do back in the 60s. While all those suits feature amazing technology, you probably won’t have much luck getting one for yourself. If you have a spare $1,000 every month though, you can rent a HAL 5 (Hybrid Assistive Limb) by Japanese robotics company Cyberdyne-a company that’s single handedly taking back all the evil robot names. The suit features one of the most advanced control systems of its kind, sensing electrical impulses in the skin it determines the user’s movement and predicts desired motion from a set of likely movements. The suit assists in locomotion and in lifting; according to Cyberdyne it increases the strength of the wearer about tenfold. It’s designed for a range of commercial tasks that involve physical labor, but If you can afford it, you should start thinking about your superhero name now. Powered exoskeletons have come a long way and boast remarkable technology, but you may be asking “where’s the heart? where’s the soul? where are the laughs?” The answer can be found at RoboNexus, the robotics conference from 2005. It was there they held Tetsujin, the world’s first exo-assisted deadlifting competition. These man-and-metal competitors used hydraulics, pneumatics, screw drives, and various other mechanisms to lift hundreds of pounds. Not every exhibition was successful, and the scientific value is questionable, but you can’t argue with the entertainment it provided. We’ve talked a lot about the power side of things and not much about armor. That’s probably because the definitive example is [Troy Hurtubise]’s Ursus personal armor suit. Designed to withstand a bear attack, it shields the wearer behind thick layers of titanium, chain mail, and fireproof rubber (for those dreaded firebreathing kodiaks). We leave you with the hilarious test video embedded above, and knowledge that despite a few missteps, the future of power suit development looks strong. Wow, that was an awesome rundown… and I could watch men in powersuits fall off cliffs all day! Wow damn, that must have been the most stunning and entertaining post in a while! Btw, congrats on this posting storm – I’m lovin’ it. Nice one juan, it’s a bit of a different style post than i’ve seen previously on hackaday, but i like it! Awesome post! Hack-a-day keeps getting better and better! I cannot believe nobody’s made the cargo loader suits from “Aliens” into reality (or did you just not deem them worthy of mention here?). I always thought those suckers looked like they could be extremely useful in certain situations. How to make an Iron Man suit. 2. Get that Bear suit or the Trojan. Get strength to carry heavy weapons and be almost impenetrable, the equivalent to Iron Man Mark 1 Suit. I get the feeling Raytheons Already thought of that. Wow… Seems like the movies has finally came true.. I actually had my arm in the GE Hardiman exoskeleton and exercised it. The technician turned on the hydraulic power and I picked up a wood pencil. I could clearly feel it but when I squeezed gently, I pinched the pencil in half. The Hardiman was to have all movements with 10X force. The force-feedback laboratory built some fabulous machines, all featuring “man-in-the-loop” philosophy. This technology found its most noticeable application in the Space Shuttle’s Robot Manipulator Arm, which features total force-feedback. 1970s technology was FUN. Real life power suits – Hack a Day great article thank you. We’ll probably see a real Iron Man in a couple more decades. Or not…I’d like to see the technology become available for old people though. So when do I get to put a Brotherhood Of Steel decal on it?